If you have a weekend trip planned and need a simple bag for your getaway, why not stitch one up? Here are some of our favorite travel bag tutorials for taking trips! Store your make up and little items in a roll or zippered pouch. Make a zippered pouch that opens all the way to easily find exactly what you need! Get the DIY from Anna at Noodlehead, the DIY Open Wide Zippered Pouch. Store mascara, lipstick and brushes in Mimi G’s Makeup Brush Roll for WeAllSew.com. Stitch up a roomy bag with The Purl Bee’s project from Molly’s Sketchbook, the Zippered Dopp Kit. Pack your weekender bag and hit the road! A classic duffle bag! Get the pattern from the Bag’n-telle blog, the Duffle Bag DIY. This sweet overnight bag has LOTS of extra pockets! Get the Plenty Of Pockets Duffle Bag DIY from Sew Can Do. 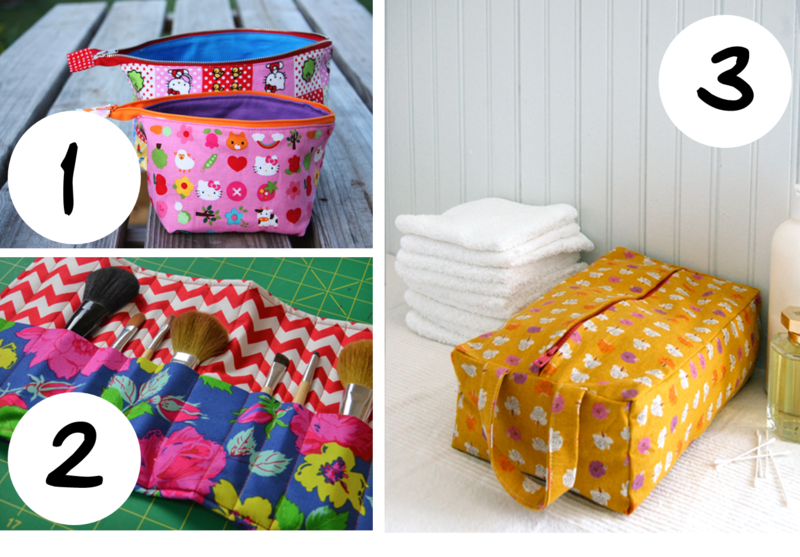 Make a pretty and roomy duffle bag with Sewplicity’s Quilted Duffle Bag Tutorial. And, if you’re traveling with lots of friends, you might need to make a few bag-tags to identify your luggage! Classy DIY tags from Design Sponge. Pretty oval tags from Soubelles. Fun and easy to make tags from ReadyMade on WeAllSew.